Stream anime episodes online for free, Watch Yu Yu Hakusho Episode 3 English version online and free episodes. Anime Episode guide, Chapter Yu Yu Hakusho Episode 3 English dubbed Kuwabara: A Promise Between Men Yusuke discovers that Kuwabara has been forced by a teacher into a policy of strict nonviolence for a week — otherwise his best friend risks losing his job and being unable to support his family. 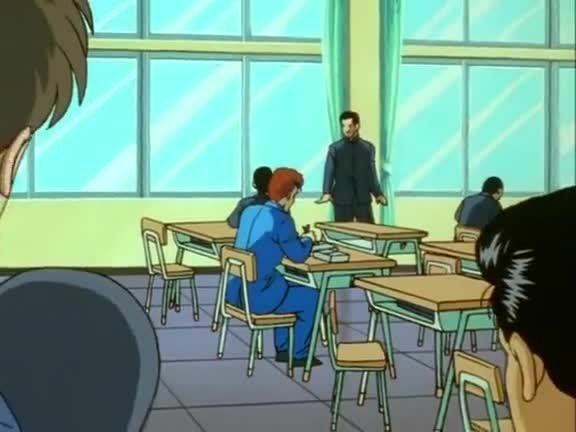 Kuwabara bears the attacks, and when the teacher puts an additional stipulation that he and his friends must get more than 50 points on the next test, Yusuke helps him study by talking to him in his dreams. The teacher attempts to cheat his way out of the promise by altering Kuwabara’s paper, and Kuwabara almost punches him, but Yusuke calls out for him to stop. The teacher is forced to change the paper back, and Kuwabara’s friend keeps his job, with Kuwabara thanking Yusuke.